This is not a perfect dinosaur turd. Or is it? A few weeks ago I had a chance to chat with Paul Taylor in the Paleontology department of the Natural History Museum. I was chatting with him about a curious specimen that has, over the years, gained a little bit of notoriety in the museum's collection. You see, it was a mystery. What you're looking at is a slide of Dinocochlea ingens. On the left, you've got the original 1922 paper which detailed the 1921 finding; in the middle, an image from a newspaper of the day (which I think would make a brilliant T-shirt!) 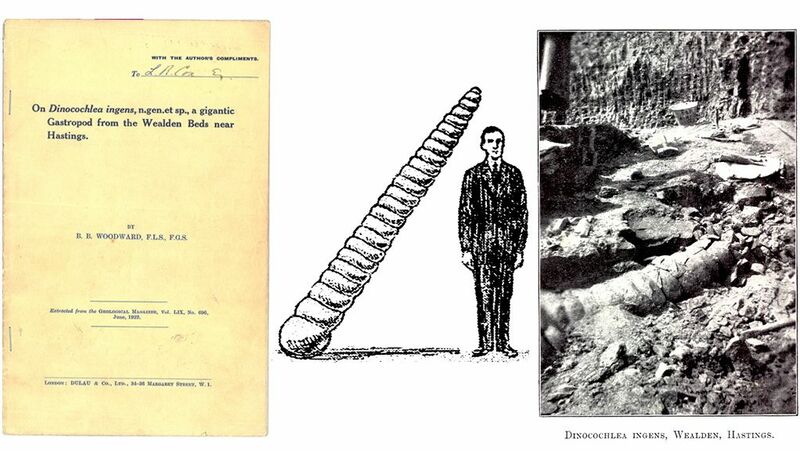 depicting the scale of the odd find; and on the far right, you can see a scan of the only photo that records the original "in ground" condition of the specimen. 1. It is a fossil of a FREAKISHLY big snail! 2. It is a coprolite, a.k.a the remnant of a giant turd (most likely from an Iguanodon). 3. It is a concretion fossil formed from the indents left underground by a spiraling path of a very small burrowing most likely worm-like organism. I love how these hypotheses form a story, since it paints a pretty good picture of how ideas in science are defined, batted about, and generally dismissed. Initially, the going hypothesis, formed by BB Woodward (the author of the above paper), and also a mollusc specialist, was that this was a massive gastropod. So big in fact that it was more than double the size of any other existing snail specimen. In fact, he was so sure it was a snail that he named it, Dinocochlea igens or terrible snail: kind of a nod to Dinosaur or terrible lizard. Unfortunately, his hypothesis didn't hold for very long. The specimen didn't look quite right to be a gastropod, since the contours of proper fossils usually exhibited certain biological nuances (as well as traces of materials from the shell). As well, the direction of the spiral was also odd - it seemed as if these Dinocochlea specimen could spiral either way, which is actually quite odd for gastropods. In any event, the next hypothesis that surfaced suggested that the huge Dinocochlea specimen was actually a large coprolite, or in non-paleo terms, big fossilized excrement. This particular theory came about because the site of extraction was noted for being a locale well known for digging up Iguanodon bones. However, this too was a little shaky. To put it bluntly, these coprolite specimens were much too "nice looking" to be remnants of feces. An organism would need some pretty fancy sphincter muscles to get such a nice "ice cream" effect. As well, coprolite pieces would have materials embedded that would be indicative of an organism's diet: this was not found to be the case here. The last hypothesis involved a fossil type known as a concretion. Essentially what might have happened here, is that long long ago, there was a remnant of a thin spiral path left in the dirt by some burrowing creature. This would have left small but physically present shifts in the grains of sand, minerals, and rock around that path, which in turn provide potential spaces for mineral cements to seep into during the process of sedimentation. Over the years, these would become squeezed into what might look like a mini spiral fossil - similar in structure to a really thin spiral drinking straw. However, these hard concretions inevitably shift the sedimentary rock that they are in, potentially creating other spaces for more mineral cement to come in. The net effect is that if the conditions are right, and if you wait long enough, concretion specimens will act like nuclei and will get "fatter." In other words, if you imagine the dimensions of a drinking straw getting wider, it might eventually look like our Dinocochlea specimen! So, is this final hypothesis the right one? Of late, Paul, as a side project, has taken it upon himself to get to the bottom of this matter - i.e. what exactly is this thing? And after some extensive physical analysis, which included attempts to model this fattening process, this third hypothesis is looking pretty good these days.